The Times of Israel published an article titled “Israel to begin promoting railway linking Haifa seaport with Saudi Arabia”, which self-explanatorily describes Israeli Transportation Minister Israel Katz’s unprecedented proposal for pioneering an overland rail route from the Mediterranean to the Persian Gulf as part of his signature “Tracks for Regional Peace” initiative. First unveiled just a few months ago, this plan envisions Israel replacing Syria as the mainland gateway for facilitating EU-Gulf trade through rail connections with Palestine, Jordan, and Saudi Arabia, the latter of which has yet to formally sign a peace deal with Israel but is widely regarded as one of its most solid regional allies in the larger Mideast proxy war against Iran. The timing of the article comes right after reports that Saudi Crown Prince Mohammed Bin Salman (MBS) held secret talks with Israeli Prime Minister Benjamin Netanyahu in the Jordanian capital of Amman, supposedly over the US’ forthcoming peace plan but which possibly also included discussions about this prospective connectivity route. In fact, the Haifa-to-Dammam rail corridor might even become a fundamental component of the so-called “New Middle East” that the Trump Administration is trying to build, given that it would represent the undeniable betterment of Israeli-Saudi relations and could even come to precede a formal peace treaty between the two de-facto anti-Iranian allies after they openly join forces in pushing the US’ soon-to-be-unveiled peace plan on the Palestinians. Symbolism aside, there are very real economic reasons for building this railway. MBS’ ambitious Vision 2030 comprehensive reform program aims to assist the Kingdom’s phased transition to its inevitable post-oil economy, to which end Riyadh is seeking billions in investment in real-sector development projects. China is slated to play a key role in this process by building up the heavily populated eastern part of the country’s southern Persian Gulf shoreline into an industrial powerhouse as part of its plans to turn Saudi Arabia into a tri-continental pivot node along its New Silk Road, which if successful could see Beijing making use of the Haifa-to-Dammam rail corridor to export products to the EU. In other words, the irony of this US-assisted plan is that it might inadvertently help China because of the very real potential that Beijing has for “piggybacking” off of it in pursuing its own self-interests, which interestingly overlap with all the relevant parties’, including Washington’s own. From the American perspective, it makes sense to invest in this project in order to exert influence over what might become one of its rival’s Silk Road branch lines, thus keeping Chinese-EU trade under the watchful eye of the US no matter which geographic domain it’s conducted across. So as not to be left out of this exciting confluence of strategic interests, Russia should endeavor to play a role in this project. The state-owned Russian Railways is already planning to participate in the construction of the Trans-Arabian Railroad (also known as the GCC Railroad) for connecting the Gulf Kingdoms, so it’s already clearly developed the connections within Saudi Arabia for clinching relevant deals. 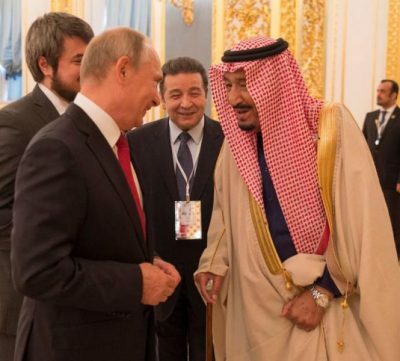 The company could therefore leverage these contacts to explore the options available for participating in the Israeli-Saudi Railway too, and considering Moscow’s excellent relations with Riyadh and Tel Aviv as a result of Russia’s fast-moving rapprochements with both of them over the past couple of years, it’s unlikely that these two increasingly independent actors would object to its proposed role even if their American ally was unhappy with it. It’s always to Russia’s benefit to participate in mutually (or in this case, multilaterally) beneficial projects with its partners, especially its newfound and non-traditional ones such as Saudi Arabia and Israel, both of whom have the available funding to reciprocally invest within the country itself as a quid-pro-quo for the successful outcome of this or any other initiative. Speaking of which, the proposed railway isn’t the only potential platform for trilateral cooperation between these three players, as MBS’ plans for constructing the so-called “NEOM future city” close to the Gulf of Aqaba could naturally involve Israel and also Russia as well. Tel Aviv has an interest in funding this nearby project and incorporating it into the so-called “Red-Med Railway” that could even potentially be expanded across part of the former Hejaz Railway route for streamlining a connectivity corridor along Saudi Arabia’s western coast to complement the GCC Railway down its eastern one. Moscow, meanwhile, could also provide financing to the NEOM future city but might additionally seek to involve its Skolkovo Innovation Center in this initiative too, thereby giving it a “big-ticket project” to attach its name to and gain further global renown. Altogether, Russia can play a crucial role in tightening the Israeli-Saudi alliance and reaping strategic dividends as a result. Economic rewards are of course the driving factor incentivizing Russian participation in these aforementioned projects, but even important though much longer-term is the role that Moscow would be playing in “balancing” out Washington’s hitherto monopolization of this partnership, which has thus far been advanced without any multipolar influence. Taking advantage of its rapid rapprochements with Israel and Saudi Arabia, Russia should market its prospective role in these initiatives as strengthening both parties’ strategic independence by proactively mitigating any possible overreliance on the US. Seeing as how China stands to gain immensely from these projects, it’s inevitable that the US will exert disproportionate influence over them with time, which is why it’s so important for Russia to apply a positive counterbalancing force when this moment finally arrives. Featured image is from InfoRos.